This chapter guides you through the installation and configuration of Samba, an open source implementation of the Server Message Block (SMB) and common Internet file system (CIFS) protocol, and vsftpd, the primary FTP server shipped with Fedora. Additionally, it explains how to use the Printer tool to configure printers. Samba is the standard open source Windows interoperability suite of programs for Linux. It implements the server message block (SMB) protocol. Modern versions of this protocol are also known as the common Internet file system (CIFS) protocol. It allows the networking of Microsoft Windows, Linux, UNIX, and other operating systems together, enabling access to Windows-based file and printer shares. Samba’s use of SMB allows it to appear as a Windows server to Windows clients. Samba is comprised of three daemons (smbd, nmbd, and winbindd). Three services (smb, nmb, and winbind) control how the daemons are started, stopped, and other service-related features. These services act as different init scripts. Each daemon is listed in detail below, as well as which specific service has control over it. The smbd server daemon provides file sharing and printing services to Windows clients. In addition, it is responsible for user authentication, resource locking, and data sharing through the SMB protocol. The default ports on which the server listens for SMB traffic are TCP ports 139 and 445. The smbd daemon is controlled by the smb service. The nmbd server daemon understands and replies to NetBIOS name service requests such as those produced by SMB/CIFS in Windows-based systems. These systems include Windows 95/98/ME, Windows NT, Windows 2000, Windows XP, and LanManager clients. It also participates in the browsing protocols that make up the Windows Network Neighborhood view. The default port that the server listens to for NMB traffic is UDP port 137. The nmbd daemon is controlled by the nmb service. The winbind service resolves user and group information received from a server running Windows NT, 2000, 2003, Windows Server 2008, or Windows Server 2012. This makes Windows user and group information understandable by UNIX platforms. This is achieved by using Microsoft RPC calls, Pluggable Authentication Modules (PAM), and the Name Service Switch (NSS). This allows Windows NT domain and Active Directory users to appear and operate as UNIX users on a UNIX machine. Though bundled with the Samba distribution, the winbind service is controlled separately from the smb service. The winbind daemon is controlled by the winbind service and does not require the smb service to be started in order to operate. winbind is also used when Samba is an Active Directory member, and may also be used on a Samba domain controller (to implement nested groups and interdomain trust). Because winbind is a client-side service used to connect to Windows NT-based servers, further discussion of winbind is beyond the scope of this chapter. See File_and_Print_Servers.adoc#sect-Samba_Distribution_Programs for a list of utilities included in the Samba distribution. You can use either Nautilus or command line to connect to available Samba shares. 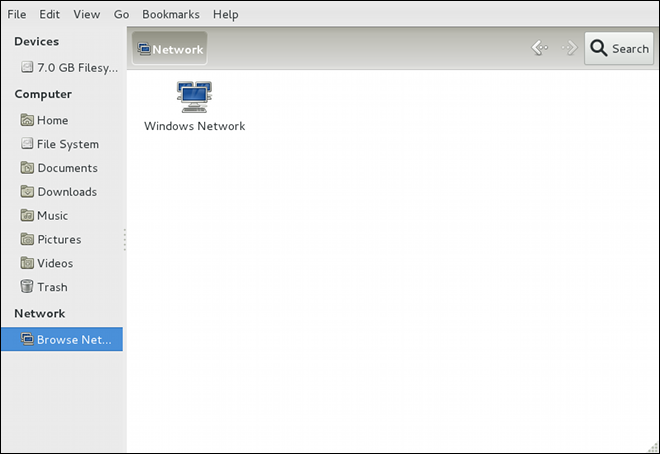 To view a list of Samba workgroups and domains on your network, select Places Network from the GNOME panel, and then select the desired network. Alternatively, type smb: in the File Open Location bar of Nautilus. An icon appears for each available SMB workgroup or domain on the network. Double-click one of the workgroup or domain icon to view a list of computers within the workgroup or domain. An icon exists for each machine within the workgroup. Double-click on an icon to view the Samba shares on the machine. If a user name and password combination is required, you are prompted for them. Replace hostname with the host name or IP address of the Samba server you want to connect to, sharename with the name of the shared directory you want to browse, and username with the Samba user name for the system. Enter the correct password or press Enter if no password is required for the user. If you see the smb:\> prompt, you have successfully logged in. Once you are logged in, type help for a list of commands. If you want to browse the contents of your home directory, replace sharename with your user name. If the -U switch is not used, the user name of the current user is passed to the Samba server. To exit smbclient, type exit at the smb:\> prompt. Sometimes it is useful to mount a Samba share to a directory so that the files in the directory can be treated as if they are part of the local file system. This command mounts sharename from servername in the local directory /mnt/point/. For more information about mounting a samba share, see the mount.cifs(8) manual page. Note that the cifs-utils package also contains the cifs.upcall binary called by the kernel in order to perform kerberized CIFS mounts. For more information on cifs.upcall, see the cifs.upcall(8) manual page. This operation can expose passwords by removing password encryption. The default configuration file (/etc/samba/smb.conf) allows users to view their home directories as a Samba share. It also shares all printers configured for the system as Samba shared printers. You can attach a printer to the system and print to it from the Windows machines on your network. To configure Samba using a graphical interface, use one of the available Samba graphical user interfaces. A list of available GUIs can be found at https://www.samba.org/samba/GUI/. Replace WORKGROUPNAME with the name of the Windows workgroup to which this machine should belong. The BRIEF COMMENT ABOUT SERVER is optional and is used as the Windows comment about the Samba system. The above example allows the users tfox and carole to read and write to the directory /home/share/, on the Samba server, from a Samba client. To set up a domain member server, you must first join the domain or Active Directory using the net join command before starting the smb service. Also, it is recommended to run winbind before smbd. The restart option is a quick way of stopping and then starting Samba. This is the most reliable way to make configuration changes take effect after editing the configuration file for Samba. Note that the restart option starts the daemon even if it was not running originally. The condrestart (conditional restart) option only starts smb on the condition that it is currently running. This option is useful for scripts, because it does not start the daemon if it is not running. When the /etc/samba/smb.conf file is changed, Samba automatically reloads it after a few minutes. Issuing a manual restart or reload is just as effective. See Services and Daemons for more information regarding this tool. Samba configuration is straightforward. All modifications to Samba are done in the /etc/samba/smb.conf configuration file. Although the default smb.conf file is well documented, it does not address complex topics such as LDAP, Active Directory, and the numerous domain controller implementations. The following sections describe the different ways a Samba server can be configured. Keep in mind your needs and the changes required to the /etc/samba/smb.conf file for a successful configuration. A stand-alone server can be a workgroup server or a member of a workgroup environment. A stand-alone server is not a domain controller and does not participate in a domain in any way. The following examples include several user-level security configurations. For more information on security modes, see File_and_Print_Servers.adoc#sect-Samba-Security_Modes. The following /etc/samba/smb.conf file shows a sample configuration needed to implement anonymous read-only file sharing. Two directives are used to configure anonymous access – map to guest = Bad user and guest account = nobody. The following /etc/samba/smb.conf file shows a sample configuration needed to implement anonymous read/write file sharing. To enable anonymous read/write file sharing, set the read only directive to no. The force user and force group directives are also added to enforce the ownership of any newly placed files specified in the share. Although having an anonymous read/write server is possible, it is not recommended. Any files placed in the share space, regardless of user, are assigned the user/group combination as specified by a generic user (force user) and group (force group) in the /etc/samba/smb.conf file. The following /etc/samba/smb.conf file shows a sample configuration needed to implement an anonymous print server. Setting browseable to no as shown does not list the printer in Windows Network Neighborhood. Although hidden from browsing, configuring the printer explicitly is possible. By connecting to DOCS_SRV using NetBIOS, the client can have access to the printer if the client is also part of the DOCS workgroup. It is also assumed that the client has the correct local printer driver installed, as the use client driver directive is set to yes. In this case, the Samba server has no responsibility for sharing printer drivers to the client. The following /etc/samba/smb.conf file shows a sample configuration needed to implement a secure read/write file and print server. Setting the security directive to user forces Samba to authenticate client connections. Notice the [homes] share does not have a force user or force group directive as the [public] share does. The [homes] share uses the authenticated user details for any files created as opposed to the force user and force group in [public]. A domain member, while similar to a stand-alone server, is logged into a domain controller (either Windows or Samba) and is subject to the domain’s security rules. An example of a domain member server would be a departmental server running Samba that has a machine account on the Primary Domain Controller (PDC). All of the department’s clients still authenticate with the PDC, and desktop profiles and all network policy files are included. The difference is that the departmental server has the ability to control printer and network shares. # Optional. Use only if Samba cannot determine the Kerberos server automatically. With the above configuration, Samba authenticates users for services being run locally but is also a client of the Active Directory. Ensure that your kerberos realm parameter is shown in all caps (for example realm = EXAMPLE.COM). Since Windows 2000/2003/2008 requires Kerberos for Active Directory authentication, the realm directive is required. If Active Directory and Kerberos are running on different servers, the password server directive is required to help the distinction. Uncomment the [realms] and [domain_realm] sections if DNS lookups are not working. For more information on Kerberos, and the /etc/krb5.conf file, see the Using Kerberos section of the Red Hat Enterprise Linux 7 System Level Authentication Guide. The net command authenticates as Administrator using the NT LAN Manager (NTLM) protocol and creates the machine account. Then net uses the machine account credentials to authenticate with Kerberos. Since security = ads and not security = user is used, a local password back end such as smbpasswd is not needed. Older clients that do not support security = ads are authenticated as if security = domain had been set. This change does not affect functionality and allows local users not previously in the domain. The following /etc/samba/smb.conf file shows a sample configuration needed to implement a Windows NT4-based domain member server. Becoming a member server of an NT4-based domain is similar to connecting to an Active Directory. The main difference is NT4-based domains do not use Kerberos in their authentication method, making the /etc/samba/smb.conf file simpler. In this instance, the Samba member server functions as a pass through to the NT4-based domain server. Having Samba as a domain member server can be useful in many situations. There are times where the Samba server can have other uses besides file and printer sharing. It may be beneficial to make Samba a domain member server in instances where Linux-only applications are required for use in the domain environment. Administrators appreciate keeping track of all machines in the domain, even if not Windows-based. In the event the Windows-based server hardware is deprecated, it is quite easy to modify the /etc/samba/smb.conf file to convert the server to a Samba-based PDC. If Windows NT-based servers are upgraded to Windows 2000/2003/2008 the /etc/samba/smb.conf file is easily modifiable to incorporate the infrastructure change to Active Directory if needed. Note that the -S option, which specifies the domain server host name, does not need to be stated in the net rpc join command. Samba uses the host name specified by the workgroup directive in the /etc/samba/smb.conf file instead of it being stated explicitly. A domain controller in Windows NT is functionally similar to a Network Information Service (NIS) server in a Linux environment. Domain controllers and NIS servers both host user and group information databases as well as related services. Domain controllers are mainly used for security, including the authentication of users accessing domain resources. The service that maintains the user and group database integrity is called the Security Account Manager (SAM). The SAM database is stored differently between Windows and Linux Samba-based systems, therefore SAM replication cannot be achieved and platforms cannot be mixed in a PDC/BDC environment. In a Samba environment, there can be only one PDC and zero or more BDCs. Samba cannot exist in a mixed Samba/Windows domain controller environment (Samba cannot be a BDC of a Windows PDC or vice versa). Alternatively, Samba PDCs and BDCs can coexist. The simplest and most common implementation of a Samba PDC uses the new default tdbsam password database back end. Replacing the aging smbpasswd back end, tdbsam has numerous improvements that are explained in more detail in File_and_Print_Servers.adoc#sect-Samba-Account_Information-Databases. The passdb backend directive controls which back end is to be used for the PDC. The following /etc/samba/smb.conf file shows a sample configuration needed to implement a tdbsam password database back end. add user script = /usr/sbin/useradd -m "%u"
delete user script = /usr/sbin/userdel -r "%u"
add group script = /usr/sbin/groupadd "%g"
delete group script = /usr/sbin/groupdel "%g"
add user to group script = /usr/sbin/usermod -G "%g" "%u"
add machine script = /usr/sbin/useradd -s /bin/false -d /dev/null  -g machines "%u"
# This sets the default profile path. Adjust the smb.conf configuration file as shown in File_and_Print_Servers.adoc#exam-Samba_Domain_Controller-PDC_Using_tdbsam. Make sure all profile, user, and netlogon directories are created. Associate the UNIX groups with their respective Windows groups. Keep in mind that Windows systems prefer to have a primary group which is mapped to a domain group such as Domain Users. Windows groups and users use the same namespace thus not allowing the existence of a group and a user with the same name like in UNIX. If you need more than one domain controller or have more than 250 users, do not use the tdbsam authentication back end. LDAP is recommended in these cases. Although it is possible for Samba to be a member of an Active Directory, it is not possible for Samba to operate as an Active Directory domain controller. There are only two types of security modes for Samba, share-level and user-level, which are collectively known as security levels. Share-level security is deprecated and has been removed from Samba. Configurations containing this mode need to be migrated to use user-level security. User-level security can be implemented in one of three different ways. The different ways of implementing a security level are called security modes. User-level security is the default and recommended setting for Samba. Even if the security = user directive is not listed in the /etc/samba/smb.conf file, it is used by Samba. If the server accepts the client’s user name and password, the client can then mount multiple shares without specifying a password for each instance. Samba can also accept session-based user name and password requests. The client maintains multiple authentication contexts by using a unique UID for each logon. The username map directive provides a path to the username map file specified in the previous step. Add the following directive to the share section in the /ect/samba/smb.conf file. Do not use the valid users directive. The following sections describe other implementations of user-level security. If you have an Active Directory environment, it is possible to join the domain as a native Active Directory member. Even if a security policy restricts the use of NT-compatible authentication protocols, the Samba server can join an ADS using Kerberos. Samba in Active Directory member mode can accept Kerberos tickets. With share-level security, the server accepts only a password without an explicit user name from the client. The server expects a password for each share, independent of the user name. There have been recent reports that Microsoft Windows clients have compatibility issues with share-level security servers. This mode is deprecated and has been removed from Samba. Configurations containing security = share should be updated to use user-level security. Follow the steps in File_and_Print_Servers.adoc#proc-Samba_Security_Modes-Samba_Guest_Shares to avoid using the security = share directive. The following is a list different back ends you can use with Samba. Other back ends not listed here may also be available. Plain text back ends are nothing more than the /etc/passwd type back ends. With a plain text back end, all user names and passwords are sent unencrypted between the client and the Samba server. This method is very insecure and is not recommended for use by any means. It is possible that different Windows clients connecting to the Samba server with plain text passwords cannot support such an authentication method. The smbpasswd back end utilizes a plain ASCII text layout that includes the MS Windows LanMan and NT account, and encrypted password information. The smbpasswd back end lacks the storage of the Windows NT/2000/2003 SAM extended controls. The smbpasswd back end is not recommended because it does not scale well or hold any Windows information, such as RIDs for NT-based groups. The tdbsam back end solves these issues for use in a smaller database (250 users), but is still not an enterprise-class solution. The ldapsam_compat back end allows continued OpenLDAP support for use with upgraded versions of Samba. The default tdbsam password back end provides a database back end for local servers, servers that do not need built-in database replication, and servers that do not require the scalability or complexity of LDAP. The tdbsam back end includes all of the smbpasswd database information as well as the previously-excluded SAM information. The inclusion of the extended SAM data allows Samba to implement the same account and system access controls as seen with Windows NT/2000/2003/2008-based systems. The tdbsam back end is recommended for 250 users at most. Larger organizations should require Active Directory or LDAP integration due to scalability and possible network infrastructure concerns. The ldapsam back end provides an optimal distributed account installation method for Samba. LDAP is optimal because of its ability to replicate its database to any number of servers such as the Red Hat Directory Server or an OpenLDAP Server. LDAP databases are light-weight and scalable, and as such are preferred by large enterprises. Installation and configuration of directory servers is beyond the scope of this chapter. For more information on the Red Hat Directory Server, see the Red Hat Directory Server 10 Deployment Guide. For more information on LDAP, see OpenLDAP. If you are upgrading from a previous version of Samba to 3.0, note that the OpenLDAP schema file (/usr/share/doc/samba-version/LDAP/samba.schema) and the Red Hat Directory Server schema file (/usr/share/doc/samba-version/LDAP/samba-schema-FDS.ldif) have changed. These files contain the attribute syntax definitions and objectclass definitions that the ldapsam back end needs in order to function properly. As such, if you are using the ldapsam back end for your Samba server, you will need to configure slapd to include one of these schema file. See Extending Schema for directions on how to do this. Network browsing enables Windows and Samba servers to appear in the Windows Network Neighborhood. Inside the Network Neighborhood, icons are represented as servers and if opened, the server’s shares and printers that are available are displayed. Network browsing capabilities require NetBIOS over TCP/IP. NetBIOS-based networking uses broadcast (UDP) messaging to accomplish browse list management. Without NetBIOS and WINS as the primary method for TCP/IP host name resolution, other methods such as static files (/etc/hosts) or DNS, must be used. A domain master browser collates the browse lists from local master browsers on all subnets so that browsing can occur between workgroups and subnets. Also, the domain master browser should preferably be the local master browser for its own subnet. By default, a Windows server PDC for a domain is also the domain master browser for that domain. A Samba server must not be set up as a domain master server in this type of situation. For subnets that do not include the Windows server PDC, a Samba server can be implemented as a local master browser. Configuring the /etc/samba/smb.conf file for a local master browser (or no browsing at all) in a domain controller environment is the same as workgroup configuration (see File_and_Print_Servers.adoc#sect-Samba-Configuring_a_Samba_Server). Either a Samba server or a Windows NT server can function as a WINS server. When a WINS server is used with NetBIOS enabled, UDP unicasts can be routed which allows name resolution across networks. Without a WINS server, the UDP broadcast is limited to the local subnet and therefore cannot be routed to other subnets, workgroups, or domains. If WINS replication is necessary, do not use Samba as your primary WINS server, as Samba does not currently support WINS replication. In a mixed NT/2000/2003/2008 server and Samba environment, it is recommended that you use the Microsoft WINS capabilities. In a Samba-only environment, it is recommended that you use only one Samba server for WINS. All servers (including Samba) should connect to a WINS server to resolve NetBIOS names. Without WINS, browsing only occurs on the local subnet. Furthermore, even if a domain-wide list is somehow obtained, hosts cannot be resolved for the client without WINS. 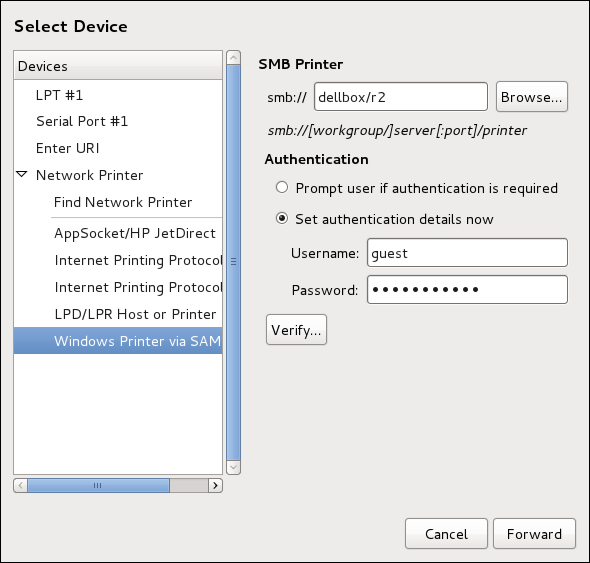 Samba allows client machines to share printers connected to the Samba server. In addition, Samba also allows client machines to send documents built in Linux to Windows printer shares. Although there are other printing systems that function with Fedora, CUPS (Common UNIX Print System) is the recommended printing system due to its close integration with Samba. Other printing configurations are also possible. To add additional security and privacy for printing confidential documents, users can have their own print spooler not located in a public path. If a job fails, other users would not have access to the file. The print$ directive contains printer drivers for clients to access if not available locally. The print$ directive is optional and may not be required depending on the organization. Setting browseable to yes enables the printer to be viewed in the Windows Network Neighborhood, provided the Samba server is set up correctly in the domain or workgroup. The net utility is similar to the net utility used for Windows and MS-DOS. The first argument is used to specify the protocol to use when executing a command. The protocol option can be ads, rap, or rpc for specifying the type of server connection. Active Directory uses ads, Win9x/NT3 uses rap, and Windows NT4/2000/2003/2008 uses rpc. If the protocol is omitted, net automatically tries to determine it. The pdbedit program manages accounts located in the SAM database. All back ends are supported including smbpasswd, LDAP, and the tdb database library. The smbcacls program modifies Windows ACLs on files and directories shared by a Samba server or a Windows server. The smbclient program is a versatile UNIX client which provides functionality similar to the ftp utility. The smbcontrol program sends control messages to running smbd, nmbd, or winbindd daemons. Executing smbcontrol -i runs commands interactively until a blank line or a 'q' is entered. The smbpasswd program manages encrypted passwords. This program can be run by a superuser to change any user’s password and also by an ordinary user to change their own Samba password. The smbtar program performs backup and restores of Windows-based share files and directories to a local tape archive. Though similar to the tar utility, the two are not compatible. The following sections give you the means to explore Samba in greater detail. /usr/share/doc/samba-<version-number>/ — All additional files included with the Samba distribution. This includes all helper scripts, sample configuration files, and documentation. https://www.samba.org/ — Homepage for the Samba distribution and all official documentation created by the Samba development team. Many resources are available in HTML and PDF formats, while others are only available for purchase. Although many of these links are not Fedora specific, some concepts may apply. https://wiki.samba.org/index.php/User_Documentation — Samba 4.x official documentation. https://www.samba.org/samba/archives.html — Active email lists for the Samba community. Enabling digest mode is recommended due to high levels of list activity. Samba newsgroups — Samba threaded newsgroups, such as www.gmane.org, that use the NNTP protocol are also available. This an alternative to receiving mailing list emails. File Transfer Protocol (FTP) is one of the oldest and most commonly used protocols found on the Internet today. Its purpose is to reliably transfer files between computer hosts on a network without requiring the user to log directly into the remote host or have knowledge of how to use the remote system. It allows users to access files on remote systems using a standard set of simple commands. This section outlines the basics of the FTP protocol, as well as configuration options for the primary FTP server shipped with Fedora, vsftpd. However, because FTP is so prevalent on the Internet, it is often required to share files to the public. System administrators, therefore, should be aware of the FTP protocol’s unique characteristics. Unlike most protocols used on the Internet, FTP requires multiple network ports to work properly. When an FTP client application initiates a connection to an FTP server, it opens port 21 on the server — known as the command port. This port is used to issue all commands to the server. Any data requested from the server is returned to the client via a data port. The port number for data connections, and the way in which data connections are initialized, vary depending upon whether the client requests the data in active or passive mode. Active mode is the original method used by the FTP protocol for transferring data to the client application. When an active mode data transfer is initiated by the FTP client, the server opens a connection from port 20 on the server to the IP address and a random, unprivileged port (greater than 1024) specified by the client. This arrangement means that the client machine must be allowed to accept connections over any port above 1024. With the growth of insecure networks, such as the Internet, the use of firewalls to protect client machines is now prevalent. Because these client-side firewalls often deny incoming connections from active mode FTP servers, passive mode was devised. Passive mode, like active mode, is initiated by the FTP client application. When requesting data from the server, the FTP client indicates it wants to access the data in passive mode and the server provides the IP address and a random, unprivileged port (greater than 1024) on the server. The client then connects to that port on the server to download the requested information. While passive mode resolves issues for client-side firewall interference with data connections, it can complicate administration of the server-side firewall. You can reduce the number of open ports on a server by limiting the range of unprivileged ports on the FTP server. This also simplifies the process of configuring firewall rules for the server. See File_and_Print_Servers.adoc#s3-ftp-vsftpd-conf-opt-net for more information about limiting passive ports. proftpd - A fast, stable, and highly configurable FTP server. vsftpd — A fast, secure FTP daemon which is the preferred FTP server for Fedora. The remainder of this section focuses on vsftpd. The Very Secure FTP Daemon (vsftpd) is designed from the ground up to be fast, stable, and, most importantly, secure. vsftpd is the only stand-alone FTP server distributed with Fedora, due to its ability to handle large numbers of connections efficiently and securely. Strong separation of privileged and non-privileged processes — Separate processes handle different tasks, and each of these processes run with the minimal privileges required for the task. Tasks requiring elevated privileges are handled by processes with the minimal privilege necessary — By leveraging compatibilities found in the libcap library, tasks that usually require full root privileges can be executed more safely from a less privileged process. Most processes run in a chroot jail — Whenever possible, processes are change-rooted to the directory being shared; this directory is then considered a chroot jail. For example, if the directory /var/ftp/ is the primary shared directory, vsftpd reassigns /var/ftp/ to the new root directory, known as /. This disallows any potential malicious hacker activities for any directories not contained below the new root directory. The parent process runs with the least privileges required — The parent process dynamically calculates the level of privileges it requires to minimize the level of risk. Child processes handle direct interaction with the FTP clients and run with as close to no privileges as possible. All operations requiring elevated privileges are handled by a small parent process — Much like the Apache HTTP Server, vsftpd launches unprivileged child processes to handle incoming connections. This allows the privileged, parent process to be as small as possible and handle relatively few tasks. All requests from unprivileged child processes are distrusted by the parent process — Communication with child processes are received over a socket, and the validity of any information from child processes is checked before being acted on. Most interaction with FTP clients is handled by unprivileged child processes in a chroot jail — Because these child processes are unprivileged and only have access to the directory being shared, any crashed processes only allows the attacker access to the shared files. /etc/rc.d/init.d/vsftpd — The initialization script (initscript) used by the systemctl command to start, stop, or reload vsftpd. See File_and_Print_Servers.adoc#s2-ftp-vsftpd-start for more information about using this script. /etc/pam.d/vsftpd — The Pluggable Authentication Modules (PAM) configuration file for vsftpd. This file specifies the requirements a user must meet to login to the FTP server. For more information on PAM, refer to the Using Pluggable Authentication Modules (PAM) chapter of the 29 Managing Single Sign-On and Smart Cards guide. /etc/vsftpd/vsftpd.conf — The configuration file for vsftpd. See File_and_Print_Servers.adoc#s2-ftp-vsftpd-conf for a list of important options contained within this file. /etc/vsftpd/ftpusers — A list of users not allowed to log into vsftpd. By default, this list includes the root, bin, and daemon users, among others. /etc/vsftpd/user_list — This file can be configured to either deny or allow access to the users listed, depending on whether the userlist_deny directive is set to YES (default) or NO in /etc/vsftpd/vsftpd.conf. If /etc/vsftpd/user_list is used to grant access to users, the usernames listed must not appear in /etc/vsftpd/ftpusers. /var/ftp/ — The directory containing files served by vsftpd. It also contains the /var/ftp/pub/ directory for anonymous users. Both directories are world-readable, but writable only by the root user. The vsftpd RPM installs the /etc/rc.d/init.d/vsftpd script, which can be accessed using the systemctl command. The restart option is a shorthand way of stopping and then starting vsftpd. This is the most efficient way to make configuration changes take effect after editing the configuration file for vsftpd. The condrestart (conditional restart) option only starts vsftpd if it is currently running. This option is useful for scripts, because it does not start the daemon if it is not running. By default, the vsftpd service does not start automatically at boot time. To configure the vsftpd service to start at boot time, use a service manager such as systemctl. See Services and Daemons for more information on how to configure services in Fedora. For more information on configuring firewalld, see the Red Hat Enterprise Linux 7 Security Guide. Sometimes one computer is used to serve multiple FTP domains. This is a technique called multihoming. One way to multihome using vsftpd is by running multiple copies of the daemon, each with its own configuration file. To do this, first assign all relevant IP addresses to network devices or alias network devices on the system. For more information about configuring network devices, device aliases, and additional information about network configuration scripts, refer to the Fedora Networking Guide. Next, the DNS server for the FTP domains must be configured to reference the correct machine. For information about BIND and its configuration files, refer to the Fedora Networking Guide. If there is more configuration files present in the /etc/vsftpd directory, calling systemctl start vsftpd.service results in the /etc/rc.d/init.d/vsftpd initscript starting the same number of processes as the number of configuration files. Each configuration file must have a unique name in the /etc/vsftpd/ directory and must be readable and writable only by root. Although vsftpd may not offer the level of customization other widely available FTP servers have, it offers enough options to fill most administrator’s needs. The fact that it is not overly feature-laden limits configuration and programmatic errors. For each directive, replace directive with a valid directive and value with a valid value. There must not be any spaces between the directive, equal symbol, and the value in a directive. Comment lines must be preceded by a hash sign (#) and are ignored by the daemon. For a complete list of all directives available, refer to the man page for vsftpd.conf. For an overview of ways to secure vsftpd, see the Red Hat Enterprise Linux 7 Security Guide. The following is a list of some of the more important directives within /etc/vsftpd/vsftpd.conf. All directives not explicitly found or commented out within vsftpd's configuration file are set to their default value. The following is a list of directives which control the overall behavior of the vsftpd daemon. listen — When enabled, vsftpd runs in stand-alone mode. Fedora sets this value to YES. This directive cannot be used in conjunction with the listen_ipv6 directive. The default value is NO. listen_ipv6 — When enabled, vsftpd runs in stand-alone mode, but listens only to IPv6 sockets. This directive cannot be used in conjunction with the listen directive. session_support — When enabled, vsftpd attempts to maintain login sessions for each user through Pluggable Authentication Modules (PAM). For more information, refer to the Using Pluggable Authentication Modules (PAM) chapter of the Red Hat Enterprise Linux 6 Managing Single Sign-On and Smart Cards and the PAM man pages. . If session logging is not necessary, disabling this option allows vsftpd to run with less processes and lower privileges. The following is a list of directives which control the login behavior and access control mechanisms. anonymous_enable — When enabled, anonymous users are allowed to log in. The usernames anonymous and ftp are accepted. See File_and_Print_Servers.adoc#s3-ftp-vsftpd-conf-opt-anon for a list of directives affecting anonymous users. banned_email_file — If the deny_email_enable directive is set to YES, this directive specifies the file containing a list of anonymous email passwords which are not permitted access to the server. The default value is /etc/vsftpd/banned_emails. banner_file — Specifies the file containing text displayed when a connection is established to the server. This option overrides any text specified in the ftpd_banner directive. There is no default value for this directive. cmds_allowed — Specifies a comma-delimited list of FTP commands allowed by the server. All other commands are rejected. deny_email_enable — When enabled, any anonymous user utilizing email passwords specified in the /etc/vsftpd/banned_emails are denied access to the server. The name of the file referenced by this directive can be specified using the banned_email_file directive. ftpd_banner — When enabled, the string specified within this directive is displayed when a connection is established to the server. This option can be overridden by the banner_file directive. By default vsftpd displays its standard banner. local_enable — When enabled, local users are allowed to log into the system. See File_and_Print_Servers.adoc#s3-ftp-vsftpd-conf-opt-usr for a list of directives affecting local users. pam_service_name — Specifies the PAM service name for vsftpd. The default value is ftp. Note, in Fedora, the value is set to vsftpd. The default value is NO. Note, in Fedora, the value is set to YES. userlist_deny — When used in conjunction with the userlist_enable directive and set to NO, all local users are denied access unless the username is listed in the file specified by the userlist_file directive. Because access is denied before the client is asked for a password, setting this directive to NO prevents local users from submitting unencrypted passwords over the network. userlist_enable — When enabled, the users listed in the file specified by the userlist_file directive are denied access. Because access is denied before the client is asked for a password, users are prevented from submitting unencrypted passwords over the network. The default value is NO, however under Fedora the value is set to YES. userlist_file — Specifies the file referenced by vsftpd when the userlist_enable directive is enabled. The default value is /etc/vsftpd/user_list and is created during installation. The following lists directives which control anonymous user access to the server. To use these options, the anonymous_enable directive must be set to YES. anon_mkdir_write_enable — When enabled in conjunction with the write_enable directive, anonymous users are allowed to create new directories within a parent directory which has write permissions. anon_root — Specifies the directory vsftpd changes to after an anonymous user logs in. anon_upload_enable — When enabled in conjunction with the write_enable directive, anonymous users are allowed to upload files within a parent directory which has write permissions. anon_world_readable_only — When enabled, anonymous users are only allowed to download world-readable files. ftp_username — Specifies the local user account (listed in /etc/passwd) used for the anonymous FTP user. The home directory specified in /etc/passwd for the user is the root directory of the anonymous FTP user. The default value is ftp. no_anon_password — When enabled, the anonymous user is not asked for a password. secure_email_list_enable — When enabled, only a specified list of email passwords for anonymous logins are accepted. This is a convenient way to offer limited security to public content without the need for virtual users. Anonymous logins are prevented unless the password provided is listed in /etc/vsftpd/email_passwords. The file format is one password per line, with no trailing white spaces. The following lists directives which characterize the way local users access the server. To use these options, the local_enable directive must be set to YES. chmod_enable — When enabled, the FTP command SITE CHMOD is allowed for local users. This command allows the users to change the permissions on files. chroot_list_enable — When enabled, the local users listed in the file specified in the chroot_list_file directive are placed in a chroot jail upon log in. If enabled in conjunction with the chroot_local_user directive, the local users listed in the file specified in the chroot_list_file directive are not placed in a chroot jail upon log in. chroot_list_file — Specifies the file containing a list of local users referenced when the chroot_list_enable directive is set to YES. The default value is /etc/vsftpd/chroot_list. chroot_local_user — When enabled, local users are change-rooted to their home directories after logging in. Enabling chroot_local_user opens up a number of security issues, especially for users with upload privileges. For this reason, it is not recommended. guest_enable — When enabled, all non-anonymous users are logged in as the user guest, which is the local user specified in the guest_username directive. guest_username — Specifies the username the guest user is mapped to. local_root — Specifies the directory vsftpd changes to after a local user logs in. local_umask — Specifies the umask value for file creation. Note that the default value is in octal form (a numerical system with a base of eight), which includes a "0" prefix. Otherwise the value is treated as a base-10 integer. The default value is 022.
passwd_chroot_enable — When enabled in conjunction with the chroot_local_user directive, vsftpd change-roots local users based on the occurrence of the /./ in the home directory field within /etc/passwd. user_config_dir — Specifies the path to a directory containing configuration files bearing the name of local system users that contain specific setting for that user. Any directive in the user’s configuration file overrides those found in /etc/vsftpd/vsftpd.conf. The following lists directives which affect directories. dirlist_enable — When enabled, users are allowed to view directory lists. dirmessage_enable — When enabled, a message is displayed whenever a user enters a directory with a message file. This message resides within the current directory. The name of this file is specified in the message_file directive and is .message by default. force_dot_files — When enabled, files beginning with a dot (.) are listed in directory listings, with the exception of the . and .. files. hide_ids — When enabled, all directory listings show ftp as the user and group for each file. message_file — Specifies the name of the message file when using the dirmessage_enable directive. The default value is .message. text_userdb_names — When enabled, text usernames and group names are used in place of UID and GID entries. Enabling this option may slow performance of the server. use_localtime — When enabled, directory listings reveal the local time for the computer instead of GMT. download_enable — When enabled, file downloads are permitted. chown_uploads — When enabled, all files uploaded by anonymous users are owned by the user specified in the chown_username directive. chown_username — Specifies the ownership of anonymously uploaded files if the chown_uploads directive is enabled. The default value is root. write_enable — When enabled, FTP commands which can change the file system are allowed, such as DELE, RNFR, and STOR. The following lists directives which affect vsftpd's logging behavior. dual_log_enable — When enabled in conjunction with xferlog_enable, vsftpd writes two files simultaneously: a wu-ftpd-compatible log to the file specified in the xferlog_file directive (/var/log/xferlog by default) and a standard vsftpd log file specified in the vsftpd_log_file directive (/var/log/vsftpd.log by default). log_ftp_protocol — When enabled in conjunction with xferlog_enable and with xferlog_std_format set to NO, all FTP commands and responses are logged. This directive is useful for debugging. syslog_enable — When enabled in conjunction with xferlog_enable, all logging normally written to the standard vsftpd log file specified in the vsftpd_log_file directive (/var/log/vsftpd.log by default) is sent to the system logger instead under the FTPD facility. vsftpd_log_file — Specifies the vsftpd log file. For this file to be used, xferlog_enable must be enabled and xferlog_std_format must either be set to NO or, if xferlog_std_format is set to YES, dual_log_enable must be enabled. It is important to note that if syslog_enable is set to YES, the system log is used instead of the file specified in this directive. The default value is /var/log/vsftpd.log. xferlog_enable — When enabled, vsftpd logs connections (vsftpd format only) and file transfer information to the log file specified in the vsftpd_log_file directive (/var/log/vsftpd.log by default). If xferlog_std_format is set to YES, file transfer information is logged but connections are not, and the log file specified in xferlog_file (/var/log/xferlog by default) is used instead. It is important to note that both log files and log formats are used if dual_log_enable is set to YES. xferlog_file — Specifies the wu-ftpd-compatible log file. For this file to be used, xferlog_enable must be enabled and xferlog_std_format must be set to YES. It is also used if dual_log_enable is set to YES. The default value is /var/log/xferlog. xferlog_std_format — When enabled in conjunction with xferlog_enable, only a wu-ftpd-compatible file transfer log is written to the file specified in the xferlog_file directive (/var/log/xferlog by default). It is important to note that this file only logs file transfers and does not log connections to the server. To maintain compatibility with log files written by the older wu-ftpd FTP server, the xferlog_std_format directive is set to YES under Fedora. However, this setting means that connections to the server are not logged. To both log connections in vsftpd format and maintain a wu-ftpd-compatible file transfer log, set dual_log_enable to YES. If maintaining a wu-ftpd-compatible file transfer log is not important, either set xferlog_std_format to NO, comment the line with a hash sign (#), or delete the line entirely. The following lists directives which affect how vsftpd interacts with the network. accept_timeout — Specifies the amount of time for a client using passive mode to establish a connection. anon_max_rate — Specifies the maximum data transfer rate for anonymous users in bytes per second. The default value is 0, which does not limit the transfer rate. connect_from_port_20 When enabled, vsftpd runs with enough privileges to open port 20 on the server during active mode data transfers. Disabling this option allows vsftpd to run with less privileges, but may be incompatible with some FTP clients. connect_timeout — Specifies the maximum amount of time a client using active mode has to respond to a data connection, in seconds. data_connection_timeout — Specifies maximum amount of time data transfers are allowed to stall, in seconds. Once triggered, the connection to the remote client is closed. ftp_data_port — Specifies the port used for active data connections when connect_from_port_20 is set to YES. idle_session_timeout — Specifies the maximum amount of time between commands from a remote client. Once triggered, the connection to the remote client is closed. listen_address — Specifies the IP address on which vsftpd listens for network connections. If running multiple copies of vsftpd serving different IP addresses, the configuration file for each copy of the vsftpd daemon must have a different value for this directive. See File_and_Print_Servers.adoc#s3-ftp-vsftpd-start-multi for more information about multihomed FTP servers. listen_address6 — Specifies the IPv6 address on which vsftpd listens for network connections when listen_ipv6 is set to YES. listen_port — Specifies the port on which vsftpd listens for network connections. The default value is 21.
local_max_rate — Specifies the maximum rate data is transferred for local users logged into the server in bytes per second. max_clients — Specifies the maximum number of simultaneous clients allowed to connect to the server when it is running in standalone mode. Any additional client connections would result in an error message. The default value is 0, which does not limit connections. max_per_ip — Specifies the maximum of clients allowed to connected from the same source IP address. pasv_address — Specifies the IP address for the public facing IP address of the server for servers behind Network Address Translation (NAT) firewalls. This enables vsftpd to hand out the correct return address for passive mode connections. pasv_enable — When enabled, passive mode connects are allowed. pasv_max_port — Specifies the highest possible port sent to the FTP clients for passive mode connections. This setting is used to limit the port range so that firewall rules are easier to create. The default value is 0, which does not limit the highest passive port range. The value must not exceed 65535.
pasv_min_port — Specifies the lowest possible port sent to the FTP clients for passive mode connections. This setting is used to limit the port range so that firewall rules are easier to create. The default value is 0, which does not limit the lowest passive port range. The value must not be lower 1024.
pasv_promiscuous — When enabled, data connections are not checked to make sure they are originating from the same IP address. This setting is only useful for certain types of tunneling. Do not enable this option unless absolutely necessary as it disables an important security feature which verifies that passive mode connections originate from the same IP address as the control connection that initiates the data transfer. port_enable — When enabled, active mode connects are allowed. For more information about vsftpd, refer to the following resources. The /usr/share/doc/vsftpd/ directory — This directory contains a README with basic information about the software. The TUNING file contains basic performance tuning tips and the SECURITY/ directory contains information about the security model employed by vsftpd. vsftpd related man pages — There are a number of man pages for the daemon and configuration files. The following lists some of the more important man pages. man vsftpd — Describes available command line options for vsftpd. man vsftpd.conf — Contains a detailed list of options available within the configuration file for vsftpd. man 5 hosts_access — Describes the format and options available within the TCP wrappers configuration files: hosts.allow and hosts.deny. https://security.appspot.com/vsftpd.html — The vsftpd project page is a great place to locate the latest documentation and to contact the author of the software. https://slacksite.com/other/ftp.html — This website provides a concise explanation of the differences between active and passive mode FTP. https://www.ietf.org/rfc/rfc0959.txt — The original Request for Comments (RFC) of the FTP protocol from the IETF. The Printers configuration tool serves for printer configuring, maintenance of printer configuration files, print spool directories and print filters, and printer classes management. The tool is based on the Common Unix Printing System (CUPS). If you upgraded the system from a previous Fedora version that used CUPS, the upgrade process preserved the configured printers. You can perform the same and additional operations on printers directly from the CUPS web application or command line. To access the application, in a web browser, go to http://localhost:631/. For CUPS manuals refer to the links on the Home tab of the web site. With the Printers configuration tool you can perform various operations on existing printers and set up new printers. You can also use CUPS directly (go to http://localhost:631/ to access the CUPS web application). 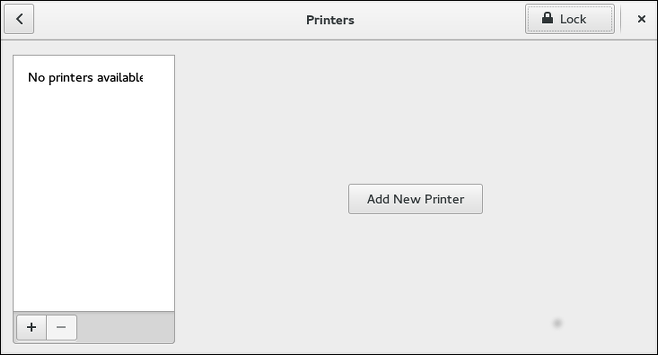 To start the Printers configuration tool if using the GNOME desktop, press the Super key to enter the Activities Overview, type Printers, and then press Enter. The Printers configuration tool appears. The Super key appears in a variety of guises, depending on the keyboard and other hardware, but often as either the Windows or Command key, and typically to the left of the Spacebar. The Printers window depicted in File_and_Print_Servers.adoc#fig-printconf-main appears. Printer setup process varies depending on the printer queue type. If you are setting up a local printer connected with USB, the printer is discovered and added automatically. You will be prompted to confirm the packages to be installed and provide an administrator or the root user password. Local printers connected with other port types and network printers need to be set up manually. Start the Printers configuration tool (refer to File_and_Print_Servers.adoc#sec-Starting_Printer_Config). Select Unlock to enable changes to be made. In the Authentication Required box, type an administrator or the root user password and confirm. Select the plus sign to open the Add a New Printer dialog. Select the printer from the list or enter its address below. Open the Add a New Printer dialog (refer to File_and_Print_Servers.adoc#sec-Setting_Printer). 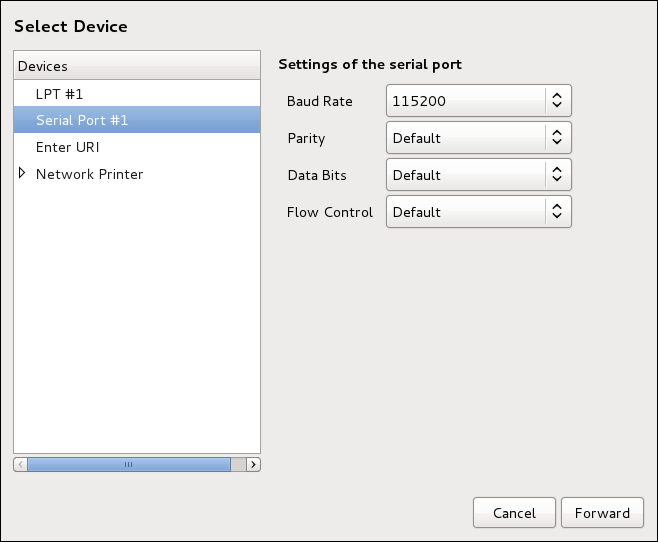 If the device does not appear automatically, select the port to which the printer is connected in the list on the left (such as Serial Port #1 or LPT #1). Select the printer model. See File_and_Print_Servers.adoc#s1-printing-select-model for details. Open the Add a New Printer dialog (refer to File_and_Print_Servers.adoc#sec-Starting_Printer_Config). 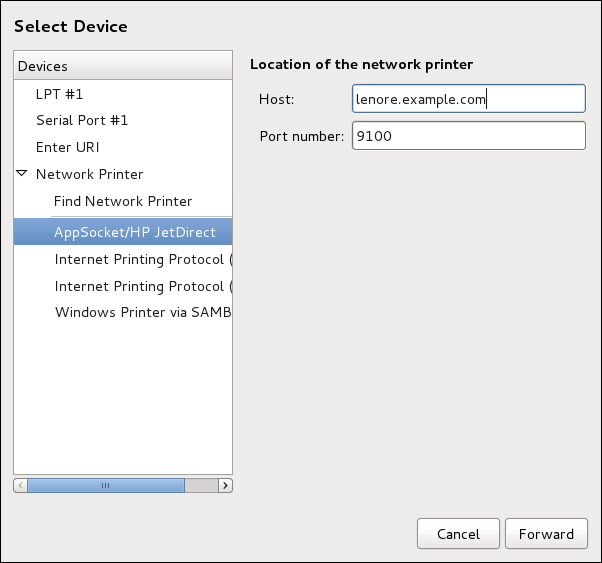 In the list on the left, select Network Printer AppSocket/HP JetDirect. Printer host name or IP address. Printer port listening for print jobs (9100 by default). An IPP printer is a printer attached to a different system on the same TCP/IP network. The system this printer is attached to may either be running CUPS or simply configured to use IPP. If a firewall is enabled on the printer server, then the firewall must be configured to allow incoming TCP connections on port 631. Note that the CUPS browsing protocol allows client machines to discover shared CUPS queues automatically. To enable this, the firewall on the client machine must be configured to allow incoming UDP packets on port 631. Open the Printers dialog (refer to File_and_Print_Servers.adoc#sec-Setting_Printer). In the list of devices on the left, select Network Printer and Internet Printing Protocol (ipp) or Internet Printing Protocol (https). The host name of the IPP printer. The queue name to be given to the new queue (if the box is left empty, a name based on the device node will be used). Optionally, click Verify to detect the printer. Open the New Printer dialog (refer to File_and_Print_Servers.adoc#sec-Setting_Printer). In the list of devices on the left, select Network Printer LPD/LPR Host or Printer. The host name of the LPD/LPR printer or host. Optionally, click Probe to find queues on the LPD host. For more information on installing packages with DNF, refer to Installing Packages. 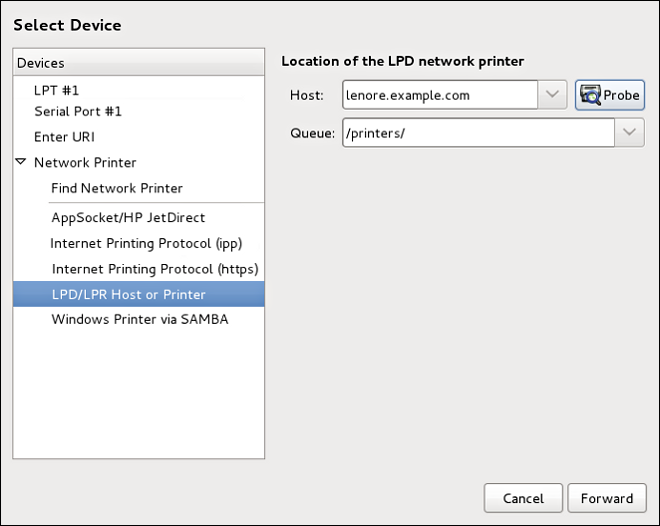 In the list on the left, select Network Printer Windows Printer via SAMBA. Enter the SMB address in the smb:// field. Use the format computer name/printer share. In File_and_Print_Servers.adoc#fig-printconf-smb, the computer name is dellbox and the printer share is r2. Click Browse to see the available workgroups/domains. To display only queues of a particular host, type in the host name (NetBios name) and click Browse. Prompt user if authentication is required: user name and password are collected from the user when printing a document. Set authentication details now: provide authentication information now so it is not required later. In the Username field, enter the user name to access the printer. This user must exist on the SMB system, and the user must have permission to access the printer. The default user name is typically guest for Windows servers, or nobody for Samba servers. Enter the Password (if required) for the user specified in the Username field. Samba printer user names and passwords are stored in the printer server as unencrypted files readable by root and the Linux Printing Daemon, lpd. Thus, other users that have root access to the printer server can view the user name and password you use to access the Samba printer. Therefore, when you choose a user name and password to access a Samba printer, it is advisable that you choose a password that is different from what you use to access your local Fedora system. If there are files shared on the Samba print server, it is recommended that they also use a password different from what is used by the print queue. Click Verify to test the connection. Upon successful verification, a dialog box appears confirming printer share accessibility. Once you have properly selected a printer connection type, the system attempts to acquire a driver. If the process fails, you can locate or search for the driver resources manually. Select printer from database — the system chooses a driver based on the selected make of your printer from the list of Makes. If your printer model is not listed, choose Generic. Provide PPD file — the system uses the provided PostScript Printer Description (PPD) file for installation. A PPD file may also be delivered with your printer as being normally provided by the manufacturer. If the PPD file is available, you can choose this option and use the browser bar below the option description to select the PPD file. Search for a printer driver to download — enter the make and model of your printer into the Make and model field to search on OpenPrinting.org for the appropriate packages. Printer brand for the Select printer from database option. PPD file location for the Provide PPD file option. Printer make and model for the Search for a printer driver to download option. If applicable for your option, window shown in File_and_Print_Servers.adoc#fig-printconf-select-driver appears. Choose the corresponding model in the Models column on the left. 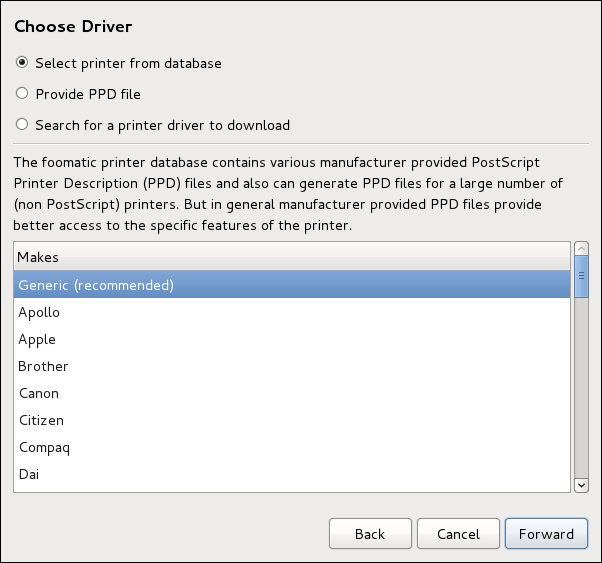 On the right, the recommended printer driver is automatically selected; however, you can select another available driver. The print driver processes the data that you want to print into a format the printer can understand. Since a local printer is attached directly to your computer, you need a printer driver to process the data that is sent to the printer. Under the Describe Printer enter a unique name for the printer in the Printer Name field. The printer name can contain letters, numbers, dashes (-), and underscores (_); it must not contain any spaces. You can also use the Description and Location fields to add further printer information. Both fields are optional, and may contain spaces. Click Apply to confirm your printer configuration and add the print queue if the settings are correct. Click Back to modify the printer configuration. After the changes are applied, a dialog box appears allowing you to print a test page. Click Print Test Page to print a test page now. Alternatively, you can print a test page later as described in File_and_Print_Servers.adoc#s1-printing-test-page. To delete an existing printer, in the Printer configuration window, select the printer and go to Printer Delete. Confirm the printer deletion. Alternatively, press the Delete key. To set the default printer, right-click the printer in the printer list and click the Set As Default button in the context menu. To change printer driver configuration, double-click the corresponding name in the Printer list and click the Settings label on the left to display the Settings page. 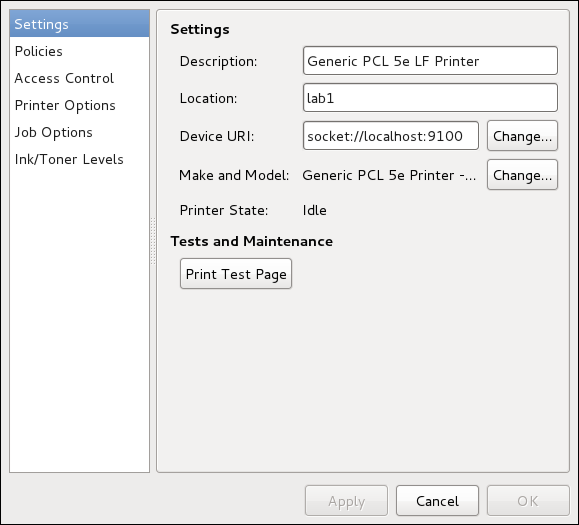 You can modify printer settings such as make and model, print a test page, change the device location (URI), and more. Click the Policies button on the left to change settings in printer state and print output. You can select the printer states, configure the Error Policy of the printer (you can decide to abort the print job, retry, or stop it if an error occurs). You can also create a banner page (a page that describes aspects of the print job such as the originating printer, the user name from the which the job originated, and the security status of the document being printed): click the Starting Banner or Ending Banner drop-down menu and choose the option that best describes the nature of the print jobs (for example, confidential). On the Policies page, you can mark a printer as shared: if a printer is shared, users published on the network can use it. To allow the sharing function for printers, go to Server Settings and select Publish shared printers connected to this system. To start the graphical firewall-config tool, press the Super key to enter the Activities Overview, type firewall and then press Enter. The Firewall Configuration window opens. You will be prompted for an administrator or root password. The Firewall Configuration window opens. Look for the word "Connected" in the lower left corner. This indicates that the firewall-config tool is connected to the user space daemon, firewalld. To immediately change the current firewall settings, ensure the drop-down selection menu labeled Configuration is set to Runtime. Alternatively, to edit the settings to be applied at the next system start, or firewall reload, select Permanent from the drop-down list. Select the Zones tab and then select the firewall zone to correspond with the network interface to be used. The default is the public zone. The Interfaces tab shows what interfaces have been assigned to a zone. Select the Services tab and then select the ipp service to enable sharing. The ipp-client service is required for accessing network printers. 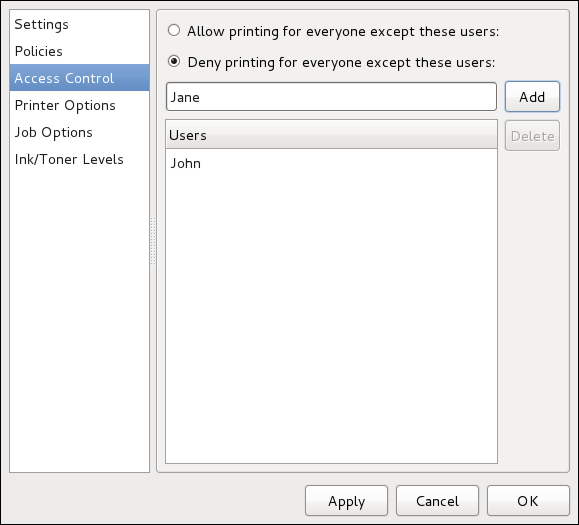 You can change user-level access to the configured printer on the Access Control page. Click the Access Control label on the left to display the page. Select either Allow printing for everyone except these users or Deny printing for everyone except these users and define the user set below: enter the user name in the text box and click the Add button to add the user to the user set. The Printer Options page contains various configuration options for the printer media and output, and its content may vary from printer to printer. It contains general printing, paper, quality, and printing size settings. On the Job Options page, you can detail the printer job options. Click the Job Options label on the left to display the page. 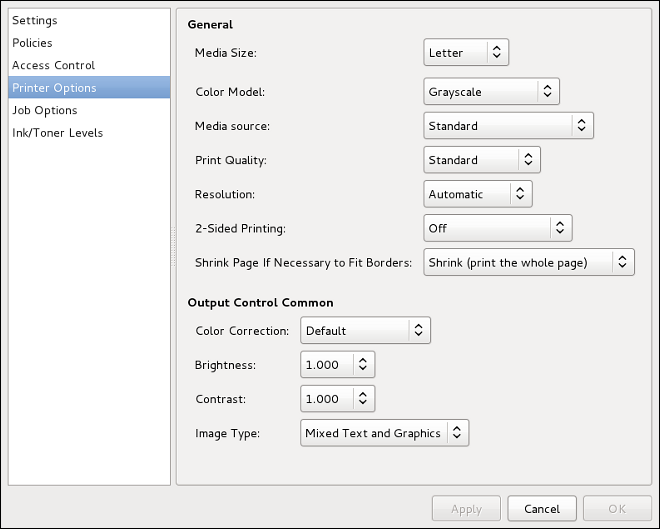 Edit the default settings to apply custom job options, such as number of copies, orientation, pages per side, scaling (increase or decrease the size of the printable area, which can be used to fit an oversize print area onto a smaller physical sheet of print medium), detailed text options, and custom job options. 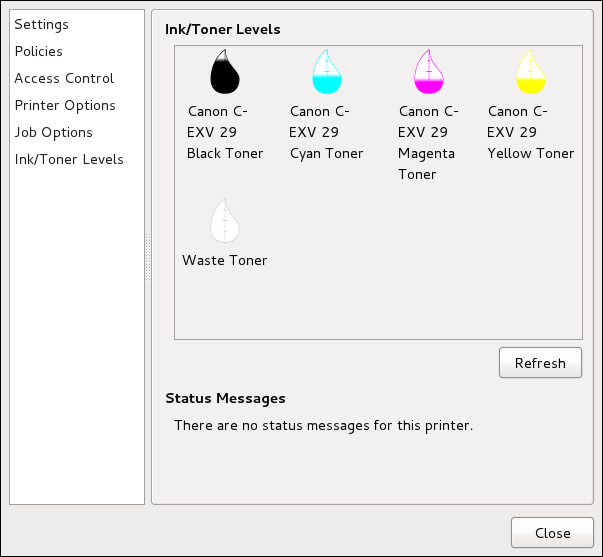 The Ink/Toner Levels page contains details on toner status if available and printer status messages. Click the Ink/Toner Levels label on the left to display the page. When you send a print job to the printer daemon, such as printing a text file from Emacs or printing an image from GIMP, the print job is added to the print spool queue. The print spool queue is a list of print jobs that have been sent to the printer and information about each print request, such as the status of the request, the job number, and more. During the printing process, messages informing about the process appear in the notification area. 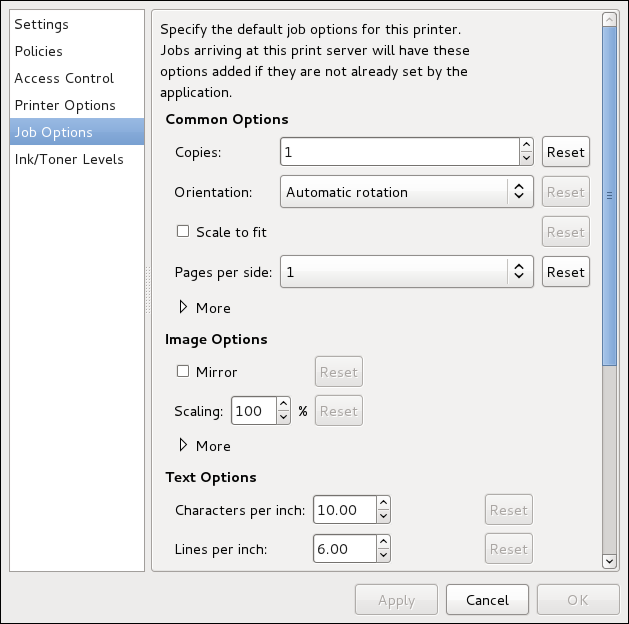 To cancel, hold, release, reprint or authenticate a print job, select the job in the GNOME Print Status and on the Job menu, click the respective command. If you want to cancel a print job, find the job number of the request with the command lpstat -o and then use the command cancel job number. For example, cancel 60 would cancel the print job in File_and_Print_Servers.adoc#lpq-example. You cannot cancel print jobs that were started by other users with the cancel command. However, you can enforce deletion of such job by issuing the cancel -U root job_number command. To prevent such canceling, change the printer operation policy to Authenticated to force root authentication. You can also print a file directly from a shell prompt. For example, the command lp sample.txt prints the text file sample.txt. The print filter determines what type of file it is and converts it into a format the printer can understand. To learn more about printing on Fedora, see the following resources. The manual page for the lpr command that allows you to print files from the command line. The manual page for the command-line utility to remove print jobs from the print queue. The manual page for the command-line utility to print multiple pages on one sheet of paper. The manual page for the CUPS printer daemon. The manual page for the CUPS printer daemon configuration file. The manual page for the class configuration file for CUPS. The manual page for the lpstat command, which displays status information about classes, jobs, and printers. Open Printing contains a large amount of information about printing in Linux. Documentation, FAQs, and newsgroups about CUPS.